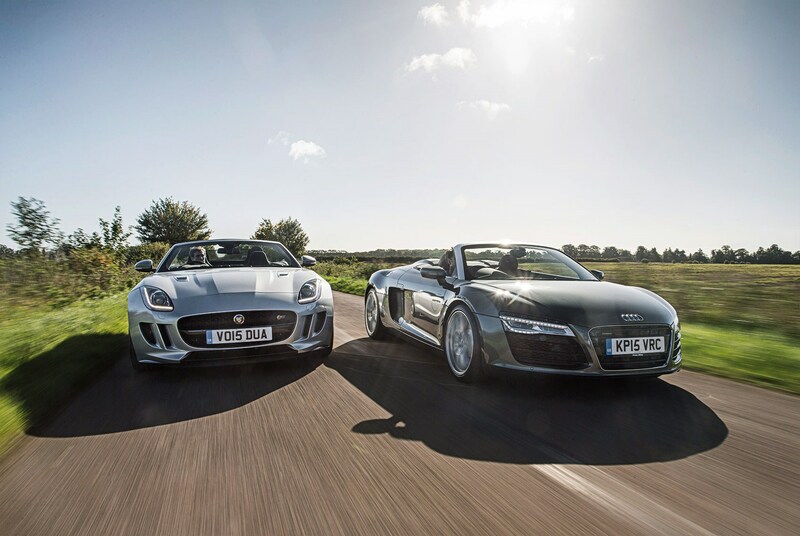 ► Secondhand Audi R8 V8 Spyder or new F-type? You’ve got £70k to spend, and must-haves include open-air motoring, sports-car style and all-wheel-drive security. What to buy? Jaguar suggests its new F-type V6 S. Previously a frisky rear-driver, the convertible is now available with all-wheel drive, keeping entertainment high while inducing fewer yelps. But for the £72k Jaguar asks, you can propel yourself into entry-level supercar territory with a secondhand Audi R8 V8 Spyder. The Spyder debuted in 2010 with V10 power, the V8 following in 2011, and the very earliest are yours for £60k-plus. Spend F-type money and you’ll get 2012-plate models with around 20,000 miles. You sit down low in the Audi, the bonnet dropping dramatically for a great view of the road and a reminder that 4.2 litres are mounted behind your head. Great V8, too. The naturally aspirated lump might be shared with Labrador-lugging RS4s, but its linear, free-revving response and hard-edged soundtrack are right at home here. Choose from manual or semi-auto transmissions, but remember Audi offered two semi-autos: first R-Tronic, then S-Tronic from 2013. R-Tronic, a clutchless manual, is ponderous, where S-Tronic is a sharper dual-clutcher; spot the later cars by their LED headlights and ‘dynamic’ turn indicators that sweep over the light cluster. If you’re looking at the earliest models, go for a manual; the open-gate six-speeder’s tactile changes make up for the tenths you lose. Our R8 gets the optional magnetic ride suspension, which fidgets over urban imperfections, but improves with speed. And that’s where the magic happens. Nibble at the limits and you’ll feel the gentle push of understeer, but the R8 will play if you’re more aggressive, especially on track; strangely, the R8 is far more rear-biased than the Lamborghini Gallardo it’s based on. The comfortable seats are positioned noticeably higher in the F-type, its slightly numb steering delivering less feedback than the Audi, the low-speed ride plusher. It might be down two cylinders, and positioned out front, but the supercharged 3.0-litre V6 pops and crackles wickedly, responds to throttle commands like a kid touching an electric fence, and sings with a beguilingly mournful warble when you’re pootling. The suspension feels softer than the F-type coupe, so there’s more roll and a less precise feeling, but it can still entertain. The roll allows you to play with the chassis, and when you do you notice how rear-biased it is: it’ll let the rear slip enough for the revs to flare, before switching more oomph to the front to curb your exuberance. The manual gearbox available on rear-drive F-types isn’t offered here, but don’t fret: the convertible’s eight-speed auto blends low-speed manners with high-speed ratio-slapping that makes a third pedal redundant. Just be sure to invest £400 on the flat-bottomed steering wheel and more tactile paddleshifters. The Audi R8 can run on two-year/variable (on-board diagnostics tip you off) or annual servicing, your choice. West London-based Audi specialists Fontain (fontain.co.uk) quote £450 including VAT for a basic variable service (oil/filter change, pollen filter change) – the pollen-filter can take an hour to swap in cars with B&O audio, and Fontain’s price factors this. A major variable service (oil and filter, pollen filter, spark plugs, air filter) costs £800, with the plugs changed at six-year/57k intervals, the air filter at 60k miles. Jaguar F-type servicing is scheduled at 12-month/16,000-mile intervals. Depending on labour and oil costs, Jaguar estimates the first three services will cost a total of £1075, the second service being the priciest. F-type buyers can also opt for three- (£995) and five-year (£1495) service plans. Based on a sensible, apocryphal 40-year-old male who loves exposing himself to the elements, Adrian Flux Insurance quotes £400 for the Audi, £344 for the Jag. One recall is listed for the R8: the fuel hose may come into contact with the heat shield, potentially causing leaks. Cars affected spanned VIN numbers WUAZZZ428AN001451 to WUAZZZ427CN000245. Check any purchase has been back to the dealer for remedial work. The Jag is covered by a three-year warranty, and European roadside assistance. Extended warranties are available – mileage dependent, see jaguar.motor-admin.com – and come with £750 of MoT insurance. The F-type has been subject to two recalls: some V6 AWD Convertible’s (VIN’s SAJWJ6FV8G8K17984 to SAJXJ6HL1GMK24640) with adaptive damping were fitted with incorrect anti-roll bars, wrong-footing the ESP system. The electric-power steering has also had gremlins, with ‘additional unexpected steering inputs’ affecting VINs SAJAC61B1G8K22719 to SAJAL61X08K22402. The Audi R8 had more options than an out-of-contract Lewis Hamilton. These include parking sensors (£670, or £1070 with rear camera); Bang & Olufsen audio (£950); metallic or pearlescent paint (£715), and matt finishes that cost a whopping £4800; you could also choose carbon-ceramic brakes (£7295), adaptive suspension (£1175) and bucket seats with electric lumbar support (£2500). 19-inch alloys were standard, but customers could option high-gloss or titanium finishes (£570). To see the full list, download an info pack from parkers.co.uk. Desirable F-type V6 S optional equipment includes body-colour roll-over bars to replace satin chrome; all 13 colours bar Ebony Black or Polaris White are either £700 or £1250; two styles of 19-inch wheel are standard, others £500, 20-inchers £1000-£2576. Carbon brakes are bundled with 20-inch Storm alloys for £6400. Extended leather costs £2725, and you can upgrade the six-speaker stereo for either a £400 10-speaker (£400) or 12-speaker (£1700) Meridian alternative. Whether you buy the Jag or Audi, you get great looks, easy comfort, eager performance, fun dynamics and very high levels of refinement, roof up or down. No easy losers here. The F-type feels like it becomes less of a driver’s car in the shift from coupe to roadster. It’s still exciting, but the coupe is sharper. But you get the comfort of a three-year warranty, that new-car magic, and you can plan out all your costs if you’re on a leasing deal. The case against the Audi is mostly about its ageing dash and that you don’t know what it’s been up to before. Still, the case for is compelling: you get supercar looks, running costs similar to an RS4’s, and someone else has swallowed the early depreciation. Dynamically, it’s hard to separate from its tin-top sibling too. I love the R8’s design, V8 engine, and its R-Tronic gearbox – you become more involved in the process by having to release pressure on the throttle during upshifts, it reminds me of my biking days. The servicing costs are realistic, it’s usable every day, and quattro comes into its own through sweeping curves. Niggles? The temp and fan controls feel lightweight, the sat-nav is badly dated, and you have to remove the engine to change the spark plugs! But to me the R8 is as much an icon as the Ur quattro. I’ve always loved the F-type, but I’ve never been the heroic opposite-lock type, so all-wheel drive suits me. It still feels really agile, but the way it puts down power really boosts confidence in tricky conditions. Combined with the soft-top, it’s a real all-seasons car – you could drive to St Moritz for skiing, or drop the roof on a summer’s day. The fact that it’s so refined, looks fantastic – I think the bonnet bulge to clear the all-wheel-drive enhances the style – and is so comfy just seals the deal.